I've had a lot of fun recently with my tiny (and unofficial) slice of the 2007 Nobel Peace Prize awarded to the Intergovernmental Panel on Climate Change (IPCC). But, though I was one of thousands of IPCC participants, I don't think I will add "0.0001 Nobel Laureate" to my resume. The other half of the prize was awarded to former Vice President Al Gore, whose carbon footprint would stomp my neighborhood flat. But that's another story. 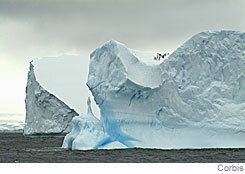 Large icebergs in the Weddell Sea, Antarctica. Winter sea ice around the continent set a record maximum last month. Both halves of the award honor promoting the message that Earth's temperature is rising due to human-based emissions of greenhouse gases. The Nobel committee praises Mr. Gore and the IPCC for alerting us to a potential catastrophe and for spurring us to a carbonless economy. I'm sure the majority (but not all) of my IPCC colleagues cringe when I say this, but I see neither the developing catastrophe nor the smoking gun proving that human activity is to blame for most of the warming we see. Rather, I see a reliance on climate models (useful but never "proof") and the coincidence that changes in carbon dioxide and global temperatures have loose similarity over time. It is my turn to cringe when I hear overstated-confidence from those who describe the projected evolution of global weather patterns over the next 100 years, especially when I consider how difficult it is to accurately predict that system's behavior over the next five days. Mother Nature simply operates at a level of complexity that is, at this point, beyond the mastery of mere mortals (such as scientists) and the tools available to us. As my high-school physics teacher admonished us in those we-shall-conquer-the-world-with-a-slide-rule days, "Begin all of your scientific pronouncements with 'At our present level of ignorance, we think we know . . .'"
I haven't seen that type of climate humility lately. Rather I see jump-to-conclusions advocates and, unfortunately, some scientists who see in every weather anomaly the specter of a global-warming apocalypse. Explaining each successive phenomenon as a result of human action gives them comfort and an easy answer. Others of us scratch our heads and try to understand the real causes behind what we see. We discount the possibility that everything is caused by human actions, because everything we've seen the climate do has happened before. Sea levels rise and fall continually. The Arctic ice cap has shrunk before. One millennium there are hippos swimming in the Thames, and a geological blink later there is an ice bridge linking Asia and North America. One of the challenges in studying global climate is keeping a global perspective, especially when much of the research focuses on data gathered from spots around the globe. Often observations from one region get more attention than equally valid data from another. The recent CNN report "Planet in Peril," for instance, spent considerable time discussing shrinking Arctic sea ice cover. CNN did not note that winter sea ice around Antarctica last month set a record maximum (yes, maximum) for coverage since aerial measurements started. Then there is the challenge of translating global trends to local climate. For instance, hasn't global warming led to the five-year drought and fires in the U.S. Southwest? There has been a drought, but it would be a stretch to link this drought to carbon dioxide. If you look at the 1,000-year climate record for the western U.S. you will see not five-year but 50-year-long droughts. The 12th and 13th centuries were particularly dry. The inconvenient truth is that the last century has been fairly benign in the American West. A return to the region's long-term "normal" climate would present huge challenges for urban planners. Without a doubt, atmospheric carbon dioxide is increasing due primarily to carbon-based energy production (with its undisputed benefits to humanity) and many people ardently believe we must "do something" about its alleged consequence, global warming. This might seem like a legitimate concern given the potential disasters that are announced almost daily, so I've looked at a couple of ways in which humans might reduce CO2 emissions and their impact on temperatures. California and some Northeastern states have decided to force their residents to buy cars that average 43 miles-per-gallon within the next decade. Even if you applied this law to the entire world, the net effect would reduce projected warming by about 0.05 degrees Fahrenheit by 2100, an amount so minuscule as to be undetectable. Global temperatures vary more than that from day to day. Suppose you are very serious about making a dent in carbon emissions and could replace about 10% of the world's energy sources with non-CO2-emitting nuclear power by 2020 -- roughly equivalent to halving U.S. emissions. Based on IPCC-like projections, the required 1,000 new nuclear power plants would slow the warming by about 0.2 ?176 degrees Fahrenheit per century. It's a dent. But what is the economic and human price, and what is it worth given the scientific uncertainty? My experience as a missionary teacher in Africa opened my eyes to this simple fact: Without access to energy, life is brutal and short. The uncertain impacts of global warming far in the future must be weighed against disasters at our doorsteps today. Bjorn Lomborg's Copenhagen Consensus 2004, a cost-benefit analysis of health issues by leading economists (including three Nobelists), calculated that spending on health issues such as micronutrients for children, HIV/AIDS and water purification has benefits 50 to 200 times those of attempting to marginally limit "global warming." Given the scientific uncertainty and our relative impotence regarding climate change, the moral imperative here seems clear to me. Mr. Christy is director of the Earth System Science Center at the University of Alabama in Huntsville and a participant in the U.N.'s Intergovernmental Panel on Climate Change, co-recipient of this year's Nobel Peace Prize. Date: Thursday, November 1, 2007, forwarded to me by Martin Katz.